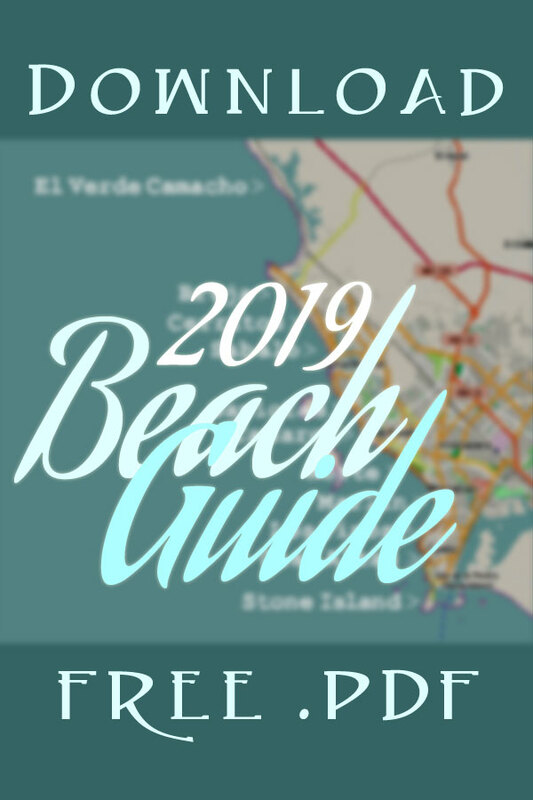 Mazatlan Centro Historico Walking Tour Guide 2019 - The best self-guided sightseeing! 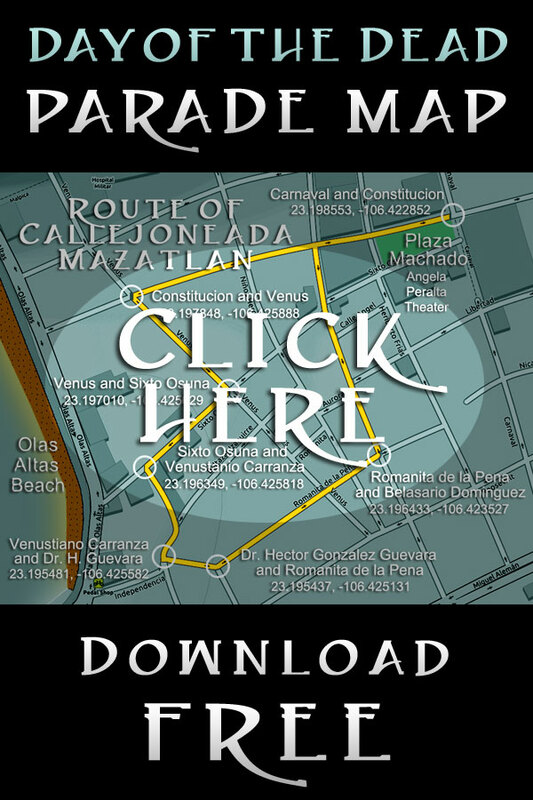 Centro Historico map that can be downloaded in .pdf format and the history and information about what you will see! 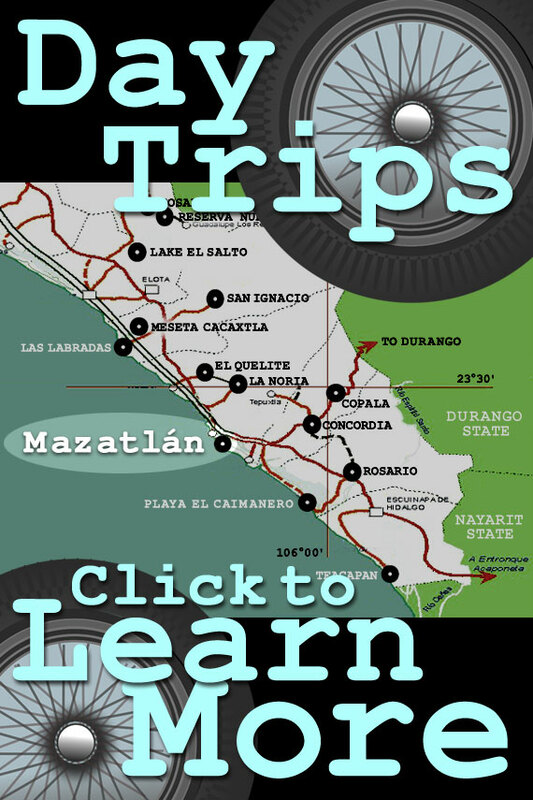 Taking a self-guided walking tour in the Centro Historico is like taking a ride in a time machine: paraded before your eyes are visions of Mazatlan's past, present and future all presented simultaneously in a glorious kaleidoscopic sensory whirl of sights, sounds and -- if you stop at any of our Centro Historico restaurants or street food vendors -- delicious flavors! Saltwater swimming fun at the north end of Olas Altas beach since 1914! 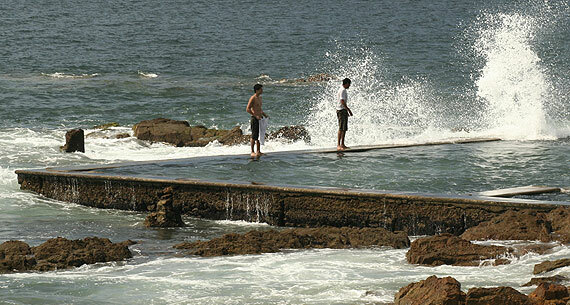 Carpa Olivera, has been a traditional beachfront destination for families in Mazatlan since the earliest days of World War One. Once part of a larger beachfront development that was destroyed by hurricanes in the mid 1900s, Carpa Olivera has a bright future. In early April 2014, the City of Mazatlan announced that the Carpa Olivera saltwater swimming pool will be entirely renovated! Work is scheduled to be completed by Summer, 2015. The Freeman Hotel -- now the Posada Freeman Best Western -- is a Mazatlan Centro Historico landmark, and the perfect place to begin or end a walking tour of the Centro Historico! This 12 story building built in 1944 was the first high-rise hotel built in northwest Mexico, and its Skybar bar and spectacular rooftop terrace provide commanding views of the Centro Historico and beyond. The elevator -- you can view the beautifully maintained 1940s machinery when you reach the top -- whisks you to the bar and its panoramic windows, and stairs lead to the open rooftop terrace complete with pool for those sore feet after a day of walking. Whether you start your walking tour at the Freeman -- or end it there with a refreshing beverage -- this view of the Centro Historico is not to be missed! 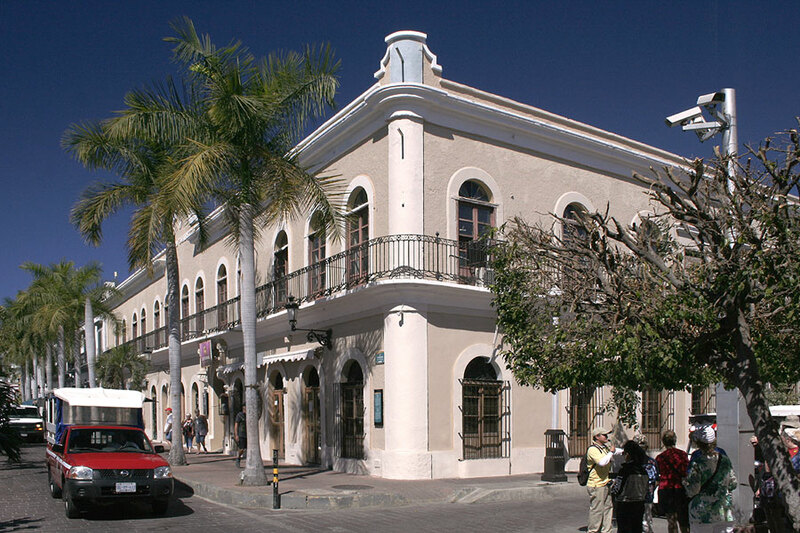 Mazatlan's fine arts museum is located in a beautifully restored Mazatlan Centro Historico building just one block off the Malecon at Olas Altas Beach. 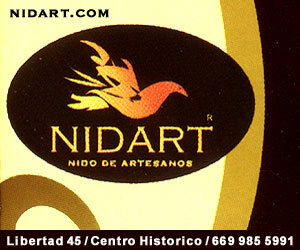 The Museo de Arte is one of the most delightful, must-see, of Mazatlan tourist attractions. 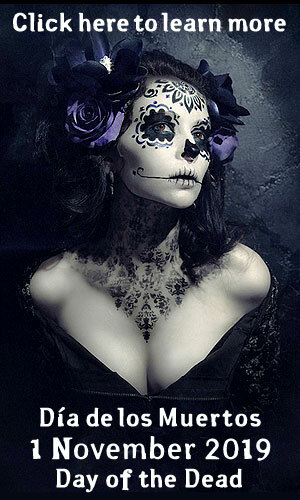 The Mazatlan Art Museum is filled with outstanding examples of 20th and 21st century Mexican art. 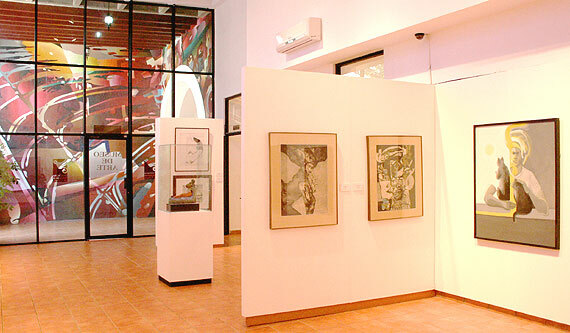 Operated by the Instituto Sinaloense de Cultura (Cultural Institute of Sinaloa), the Museo de Arte is an excellent example of the intelligent best-use of a Centro Historico vintage building. 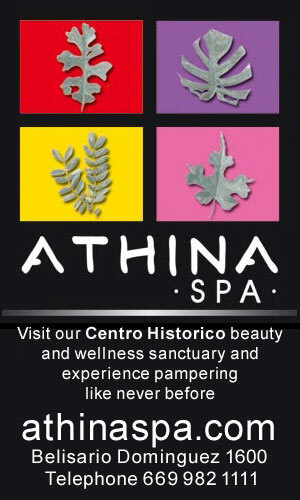 Our Centro Historico archaeology museum and pre-Colonial Sinaloa! 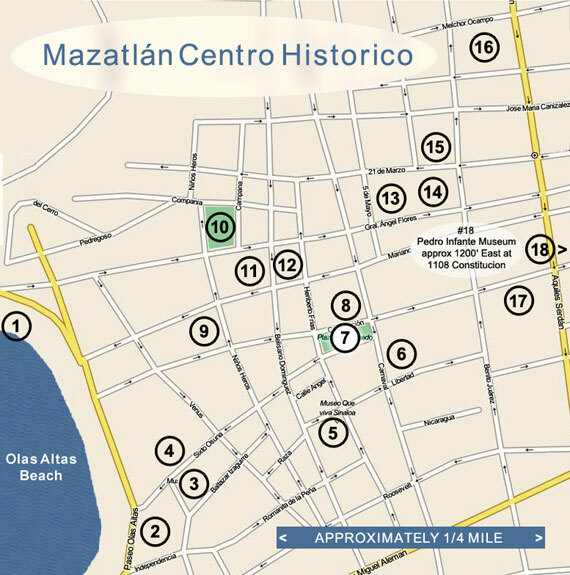 The Museo Arqueológico de Mazatlán -- Mazatlan's archaeology museum -- offers well-organized exhibits outlining pre-Columbian Sinaloan history and culture and is a great Mazatlan Centro Historico walking tour stop. 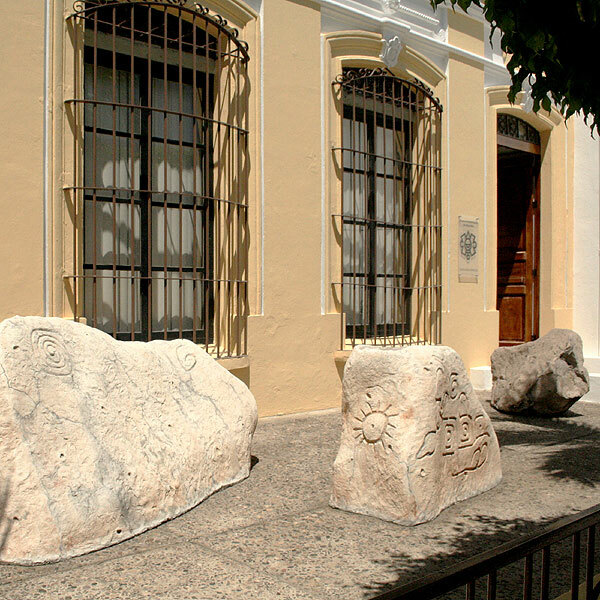 The Mazatlan Archaeology Museum is located within a beautifully restored buliding just four blocks from the Plaza Machado in the Mazatlan Centro Historico and directly across the street from the Museo De Arte. 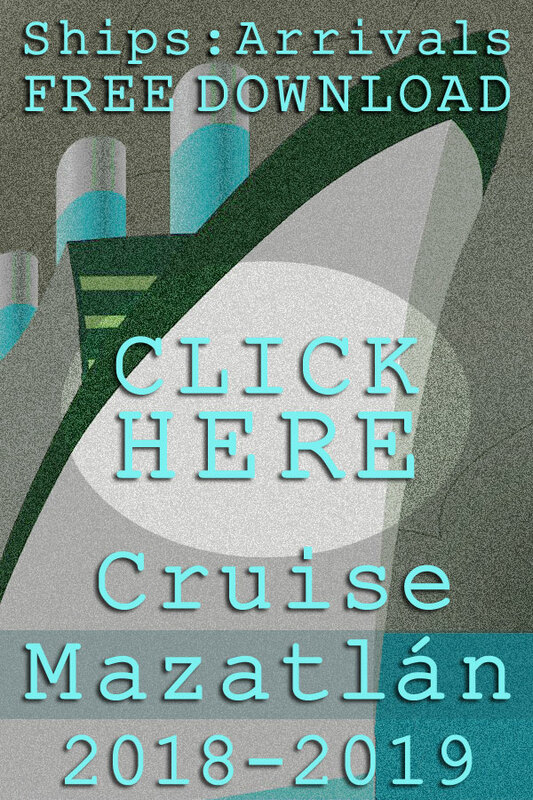 The brainchild of Arturo Santamaría, a noted Mazatlan history teacher, Museo Que Viva Sinaloa is dedicated to presenting information about the history of Sinaloa and the accomplishments of its citizens. Located in a beautifully restored classic Centro Historico building, the museum contains paintings, photographs, videos and displays that pay homage to the best of Sinaloa including Sinaloans who have excelled nationally and internationally in art, science and sport. 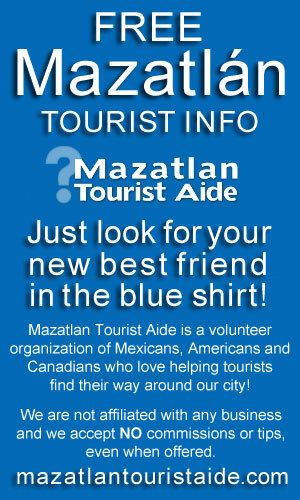 Re-focus your Mazatlan Centro Historico walking tour and learn about the history and people of the State of Sinaloa! At a bit over 800 seats, the Angela Peralta is a substantial performance space that retains an intimate feel, and the highly sophisticated design of its beautiful Italianate mezzanine and balconies provide excellent sight lines from even the least expensive seats in this theater! One of the most highly recommended destinations in the Mazatlan City Guide, the Plaza is the heart of the Mazatlan Centro Historico, and one of the loveliest plazas in all of Mexico. 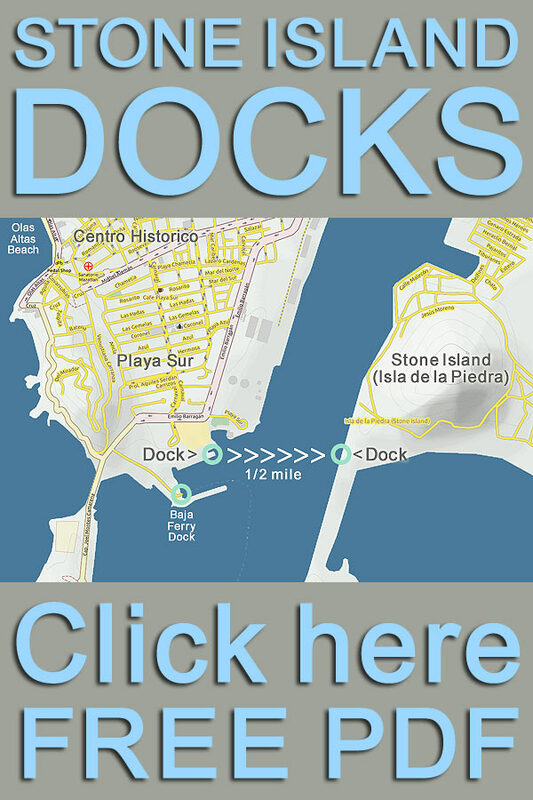 Plaza Machado has long been one of the most popular Pearl of The Pacific tourist attractions. 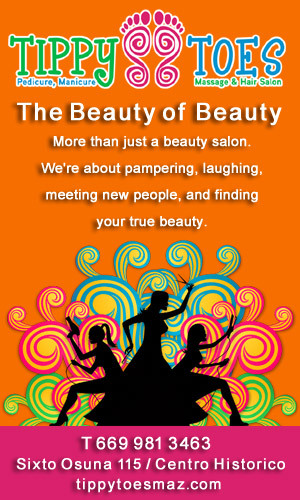 The plaza is a great place pause your Centro Historico walking tour, sit down and just people-watch! 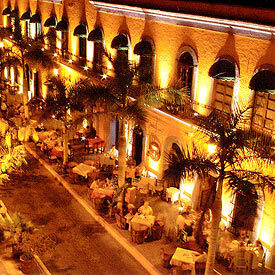 The Plazuela Machado that we know today was originally constructed in 1837 and is the oldest plaza in Mazatlan. 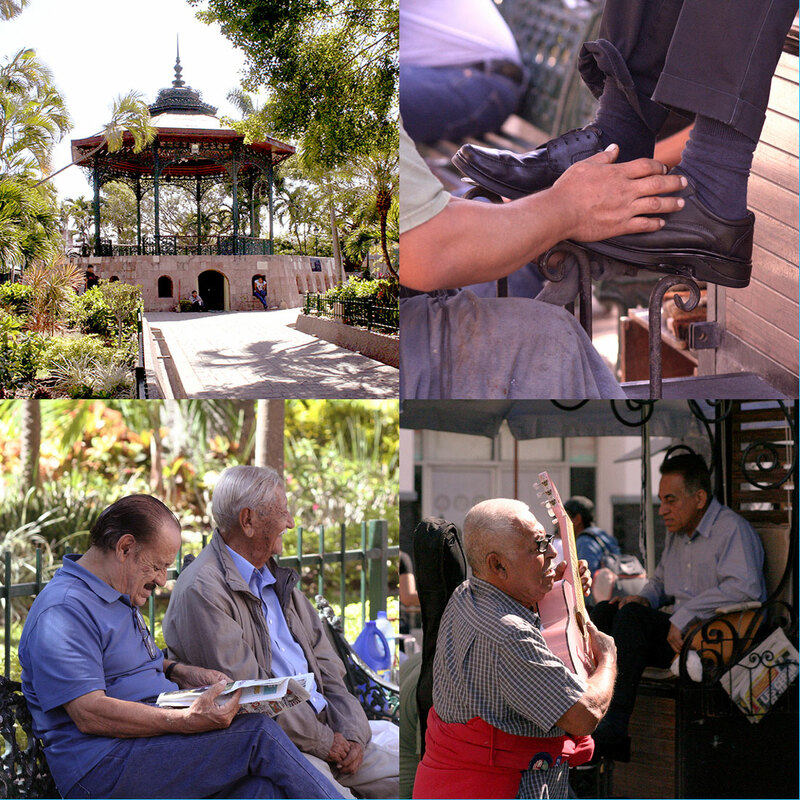 Once referred to as Paseo de las Naranjas (Orange Tree Walk) because of the orange trees that surrounded the space, the plaza quickly became a focal point for the community, and a place where Mazatlecos of all social classes gathered. The beautiful iron gazebo in the center of the square was built in 1870, serving as a platform for performers and further cementing the plaza as a central public space. 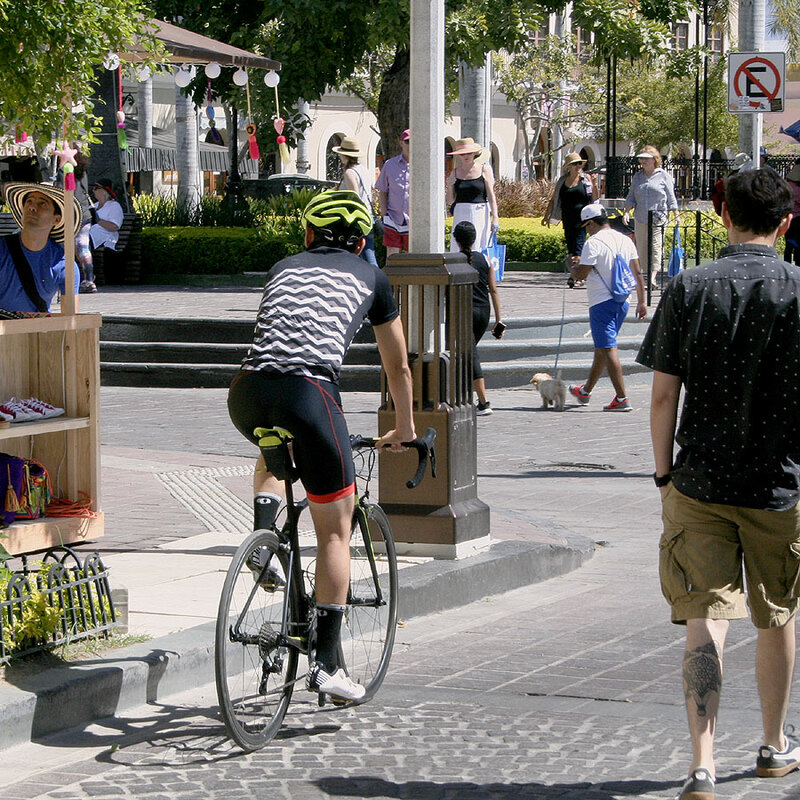 The Plaza Machado and surrounding Centro Historico feature architecture influenced by the French and Spanish, and the Plaza Machado brings back an era when Mazatlecos spent leisurely afternoons and evenings around these public spaces. Today the restored Plaza Machado and its 19th century historic buildings are populated with sightseeing and tourist attractions like chic cafés; bars; art galleries; the Angela Peralta Theater; and other Mazatlan Centro Historico cultural attractions. The Plaza Machado is a Mazatlan City Guide favorite and a great place to relax, eat and drink after a day of walking tour sightseeing and shopping in the Centro Historico. Located just north of the Plaza Machado on Constitucion and on Carnaval just off the Plaza, the Juarez Building and Lizarraga House represent some of the best examples of 19th and early 20th century Centro Historico landmark architecture -- and walking tour must-stops right at the Plazuela Machado! 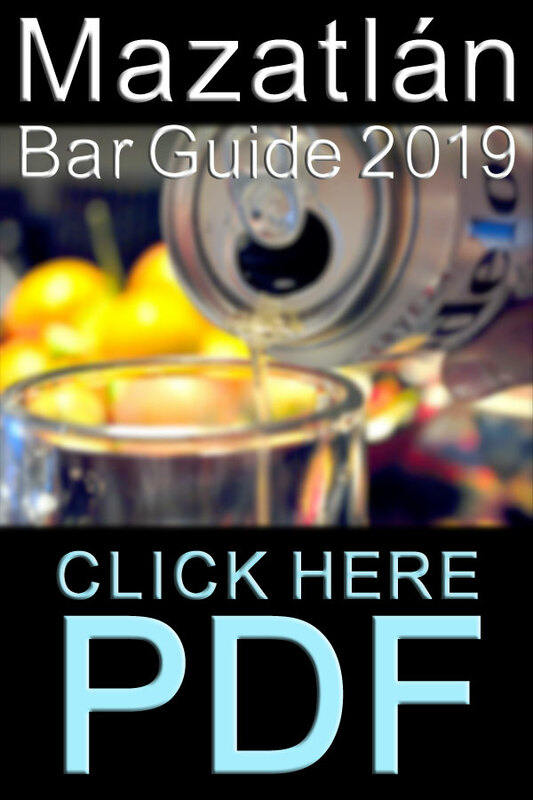 • The Juarez Building -- now the location of the renowned Centro Historico restaurant Pedro y Lola -- is the older of the two buildings, dating from the mid-1800s. This gorgeous building has a spectacular wrap-around second floor balcony with lovely ironwork. Designed by Spaniard Federico Imana, the Juarez Building was designed to house both businesses and provide space for recreational activities. 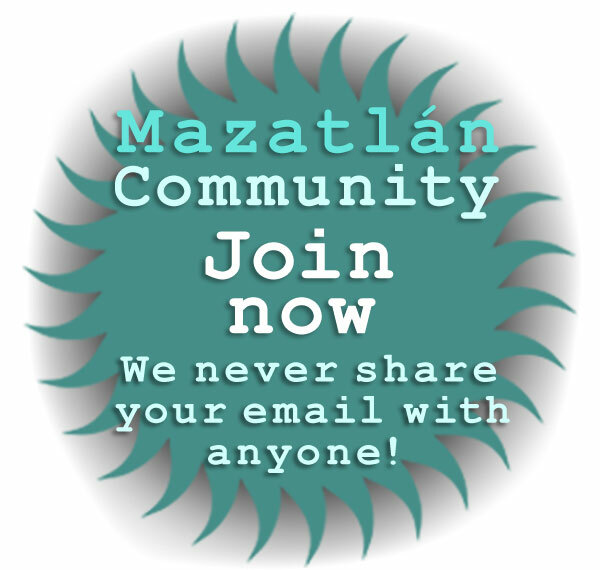 Many Mazatlan organizations like La Gran Sociedad, the German Club, the Benito Juarez Group and the Lions Club held meetings on the second floor while a hardware store, medical offices, a pharmacy and a publishing firm occupied offices at street level. Notably, the first film ever screened in Sinaloa State was was projected in a space within the Juarez Building through a Lumiere Brothers projector -- in 1897! This same side of the Plaza Machado -- the north side bounded by Constitucion -- is also home to several other fine restaurants including the delicious La Tramoya. • Lizarraga House -- beautifully restored and a lovely pale yellow -- is located just north of the Juarez Building on Carnaval. Lizarraga House was built in 1910 and features exquisite ironwork and architectural details. Mazatlan Centro Historico Tropical Style architecture at its best! 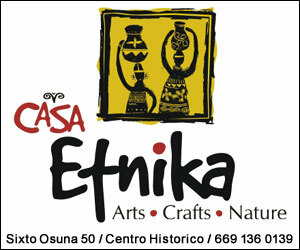 Casa Garcia is a beautiful example of Mazatlan Classical Tropical Style architecture. 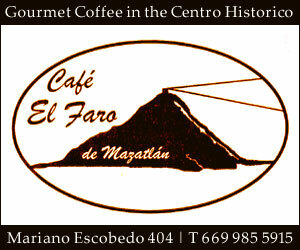 Constructed in 1876, it has been a focal point within the Centro Historico ever since. 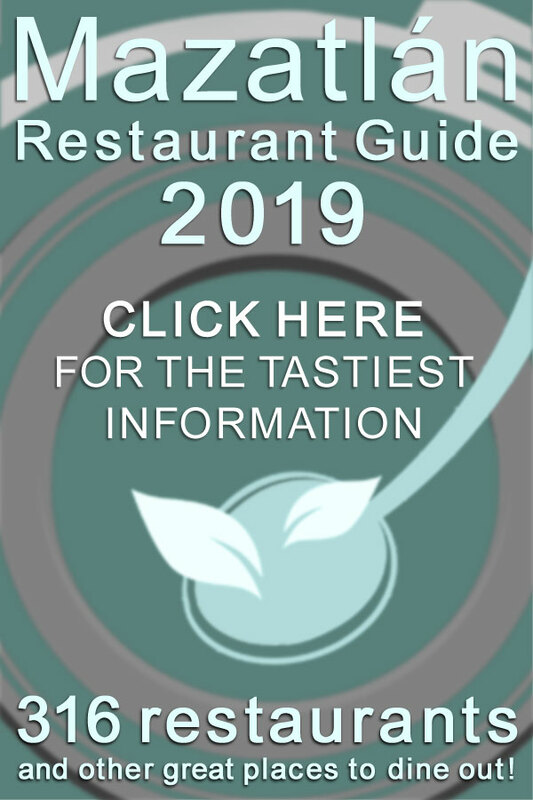 The house has been owned by a number of families over the past 135+ years, and is now owned by Chef Diego Becerra, whose grandmother lived in the home long ago. The structure has been beautifully restored and now is home to El Presidio, one of the Centro Historico's most elegant restaurants. Take a pause on your Centro Historico walking tour and check out the spectacular Casa Garcia courtyard where fig, laurel and banyan trees reach upward to the sky! 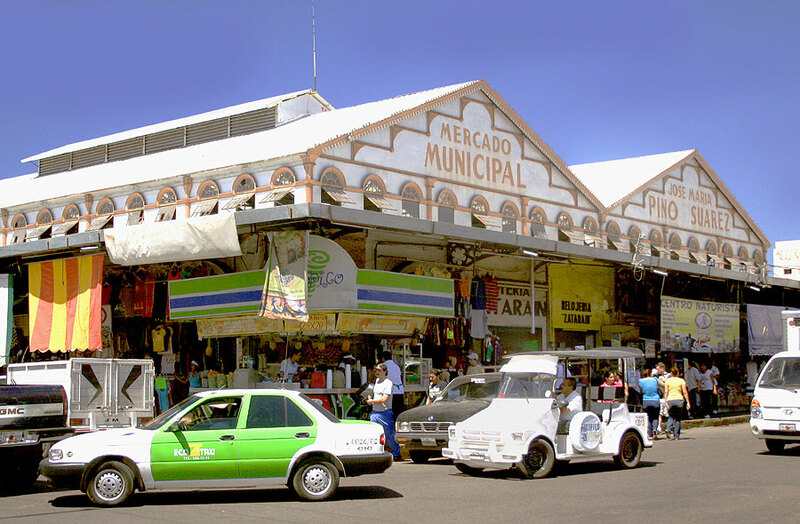 Named after the father of Mexican independence, Miguel Hidalgo, Plazuela Hidalgo is the second oldest square in the city -- after Plaza Machado -- and was the original site of the Mazatlan central market. The plaza is often referred to as Plazuela de los Leones because of the two lion sculptures that flank the entrance to the library. The square has been an important meeting place in the Centro Historico since the mid-1800s and, until 1899 had a large statue of Miguel Hidalgo at its center. 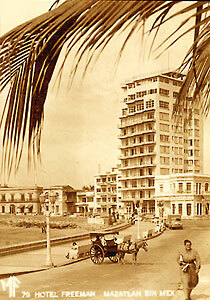 Now Plazuela de los Leones is dominated by the Ben Franklin Library (Biblioteca Benjamin Franklin) and the Mazatlan Municipal Library that house collections of Spanish books, texts and documents relating to Mazatlan and the history of Mexico, as well as some English language reading materials. The Plaza itself is packed with palm trees and wrought iron benches -- a great place to pause your Centro Historico walking tour, relax, catch your breath and read! Starting in April 2015 there is another very cool reason to visit Plazuela de los Leones: on Fridays and Saturdays it is the location of the Literary Bazaar, an open air market for antiques, antique books and other collectibles harvested from the homes of old Mazatlan families! 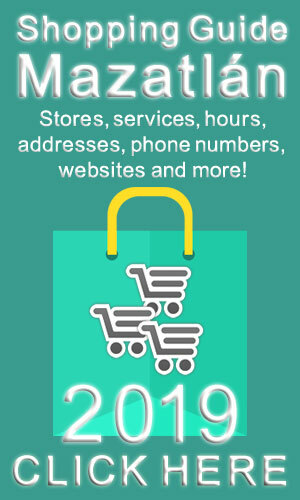 The German Notions Store was founded in the 1840's and remained in operation for over 100 years. The building that you see was constructed in 1904. This mainstay of high-line Mazatlan shopping was filled with a very wide range of types of dry goods including watches, jewelry, furniture, paintings and musical instruments, as well as more mundane necessities like typewriters, hardware, untiles and farm and mining tools. During WWII -- because of his German heritage -- the owner was forced to close the store and leave Mexico. 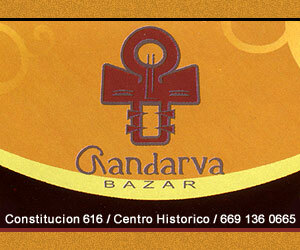 A Mazatlan Centro Historico commercial center since 1847! The spectacular yellow and white Reynaud Building has served many purposes in its long lifetime, and is still a vibrant part of the Centro Historico. The original structure was built in 1847 and used as a store selling French fabrics operated by German Baston. In the late 1800s a fire and subsequent bankruptcy enabled Baston's partner, Louis Reynaud, to buy the building. Reynaud was a wealthy merchant who was also the French consul in Mazatlan, and he completely re-built the structure, finishing in the early 1900s. The facade of the Reynaud building is adorned with stone imported from France, and cobalt blue and yellow untiles imported from Spain were used on both the exterior and interior. The building features many fine architectural details including untiled window frames and -- unusual in the Centro Historico -- wooden balconies. 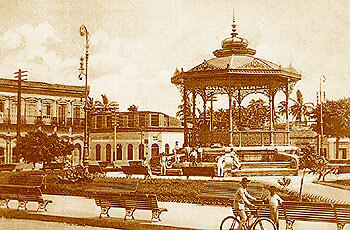 The building served as home to several stores that sold European goods, and later as a railway station and as the first airline ticket office in Mazatlan. The Reynaud Building was once again rehabbed and re-purposed in 2010, becoming a vibrant Centro Historico home for new Mazatlan businesses like our delicious Culinary Market and the sumptuous Athina Spa. 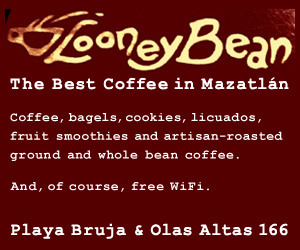 A great place to take a break from your Centro Historico walking tour and pick up a bite to eat! The Mazatlan City Hall is over 140 years old. 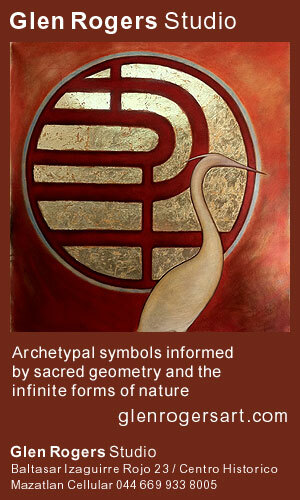 Now primarily offices, if you walk inside you can view two interesting large murals painted by Aaron Zamudio. The first depicts Mazatlan's bicentennial in 2010; the other is a symbolic portrayal of the revolution packed with images of war, generals, political icons and religious symbols. Plaza Republica faces the magnificent Basilica de la Inmaculada Concepción, Mazatlan's largest Catholic church, and the Mazatlan City Hall. 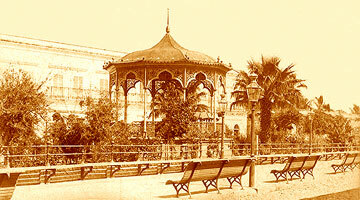 Originally constructed in 1870, at the center of Plaza de la Republica you will find a lovely ironwork Porfirian bandstand that was constructed in 1909. The plaza now has large palm trees that provide shade and verdant foliage that give the entire space a tropical feel. There are numerous vendors of many types and a distinct concentration of shoe shine and shoe repair stalls. No Centro Historico walking tour is complete without a visit to Plaza Republica! 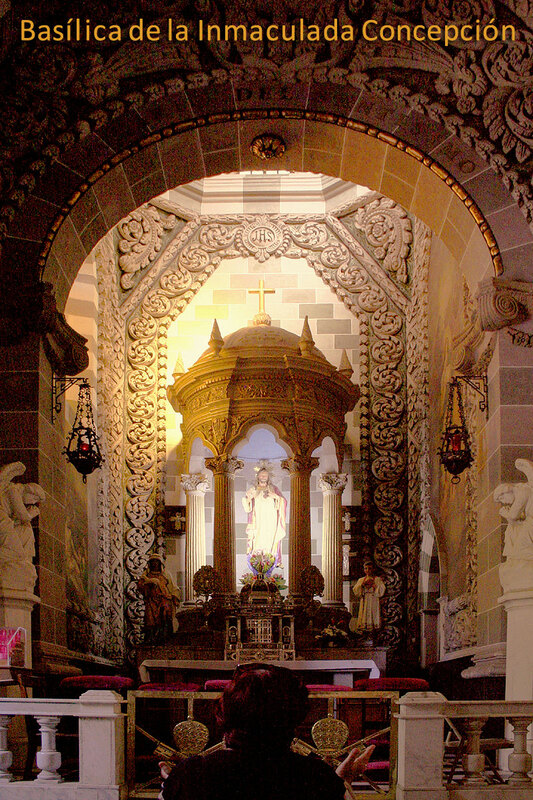 In the view of the Mazatlan City Guide, no day spent walking and sightseeing in the Centro Historico is complete without visiting the Basilica de la Inmaculada Concepcion -- the very heart of the Centro Historico and The Pearl of The Pacific. Begun by the Bishop Pedro Loza y Pardave in 1856, the central Mazatlan Cathedral was built on the site of an ancient Indian temple. 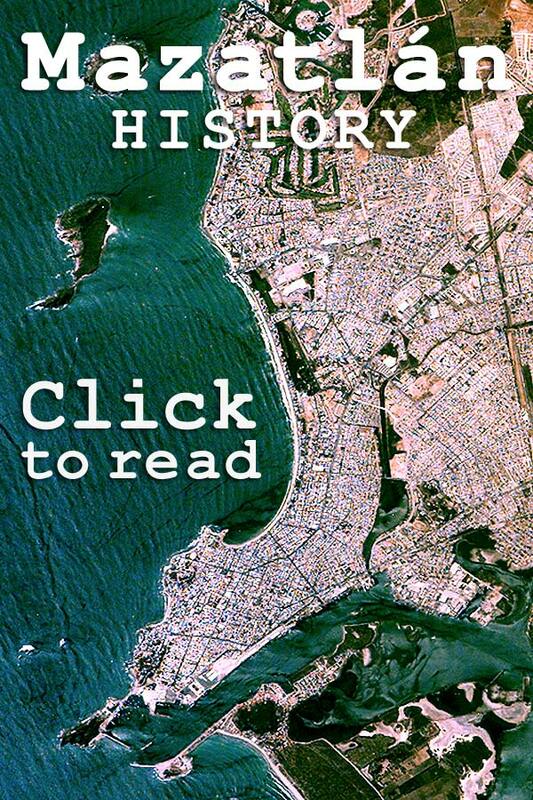 Mazatlan's turbulent history delayed the completion of the church until 1899. In 1937 -- after additional work -- the church was elevated to the status of a "basilica", a Roman Catholic church or cathedral given special ceremonial privileges by the Pope. Inside the Basilica, the image of the city's patron saint, the Virgen de la Purisima Conception (Virgin of the Immaculate Conception) floats over the glided, baroque main altar. Overhead, soaring rounded Renaissance domes and gilded Gothic arches create an airy and spiritual space. 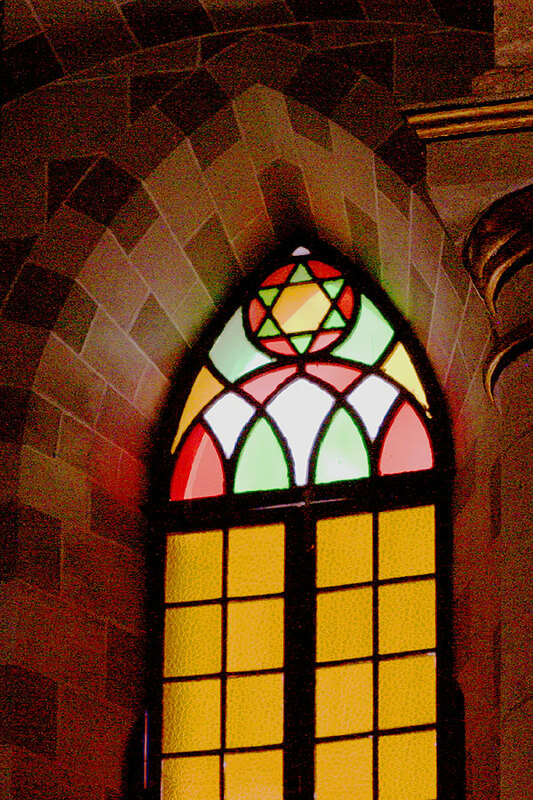 The Basilica also has a unique architectural feature: each of its 28 stained glass windows incorporates a Star of David which were installed in gratitude for the donation of construction funds by a wealthy Mazatlan Jewish family. No specific donor has ever been named. The Catedral Basilica de Mazatlan also has a majestic organ built in Paris by Aristide Cavaille-Coll, widely considered one of the greatest organ builders of the nineteenth century. Visit our nearly 120 year old classic Mazatlan Centro Historico market! Imagine a market being listed as one of the Mazatlan City Guide most highly recommended Centro Historico walking tour attractions? Well it is, and we cannot too highly recommend a visit to our central market, the Mercado Pino Suarez. Located at Aquiles Serdan and Melchor Ocampo in the Centro Historico since 1900, Mazatlan's Mercado Jose María Pino Suarez market is a great shopping experience that has been a recommended tourist attraction for many years! The Pino Suarez Market is divided in sections by food types. You'll find aisles with fresh seafood; chickens; beef; and pork -- and miles of aisles of fresh fruits and vegetables. The Central Mercado also has cheese vendors -- featuring some delicious locally produced farmers cheeses -- as well as herb and spice shops. Beyond food, the Mazatlan Mercado has numerous shops and vendors of tourist items, like t-shirts, hats, and all sorts of souvenirs of your day of sightseeing in the Centro Historico. Often overlooked, stairs at the Mazatlan Mercado Pino Suarez lead to an upper level that has numerous small restaurants, many with a balcony view over the delightfully active street scene surrounding the outer stores and street carts. Mercado restaurants make for a wonderful -- and inexpensive -- place to take a break from walking tour sightseeing and have some fresh seafood or delicious carne asada! One of the most unusual restaurant spaces anywhere in the world! 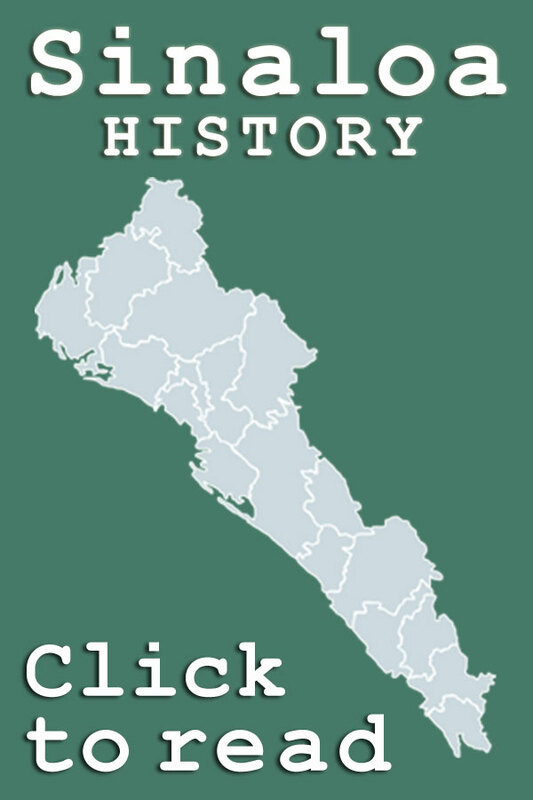 One of the benchmarks of urban development in the 1800s -- anywhere in the world -- was the establishment of municipal water systems, and in the mid 1800s Mazatlan had three massive cisterns to supply freshwater to its rapidly expanding population. One of these -- located at Constitucion 710 in the Centro Historico -- survives, and has now been re-purposed as the highly eclectic El Aljibe de S. Pedro restaurant. Born in Mazatlan in 1917, Pedro Infante is arguably the most important star of the Golden Age of Mexican Cinema, a period that is generally defined as starting in the mid 1930s and lasting to the late 1960's. 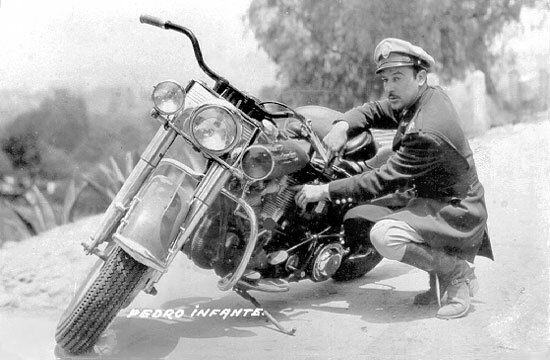 Infante made an astounding 62 films in his 18 year career, nearly all of which he starred in. Extremely versatile, his performances encompass dramatic roles to slapstick comedy -- and everything in between. 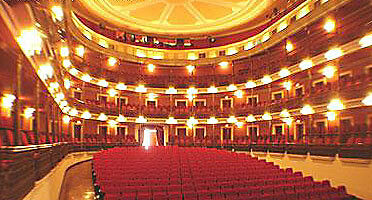 Infante's career as a singer was as prolific as was his acting career. In just 13 years -- 1943 to 1956 -- Infante recorded a remarkable 366 songs, many of which are classics. 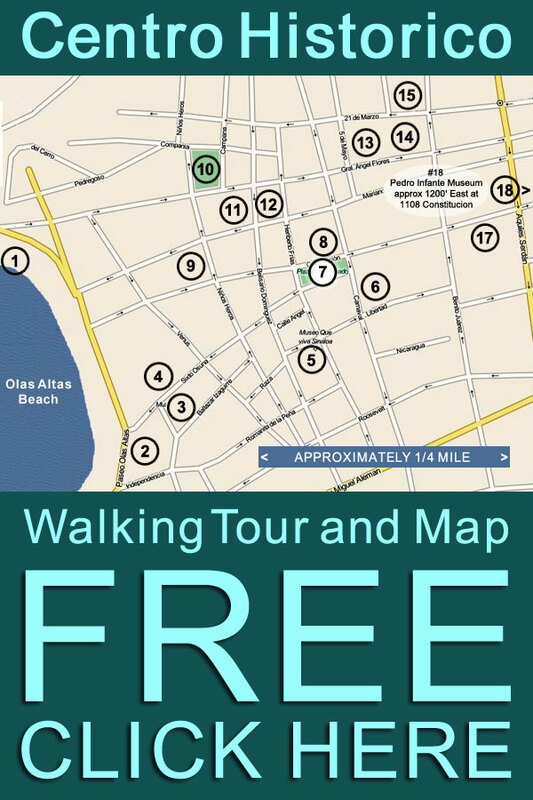 Enjoy a day of sightseeing in the Centro Historico by using our free map and directions to take a self-guided Mazatlan walking tour of the heart of the Pearl of The Pacific, the Centro Historico!